In a year when projecting the best player eligible for the 2014 NHL Draft might be as stern a challenge as it's ever been, Kingston Frontenacs center Samuel Bennett was the desired choice from start to finish in the minds of the gurus at NHL Central Scouting. Bennett, considered the top player by Central Scouting in its midterm ranking in January, again is No. 1 on the final list of the top draft-eligible skaters in North America. Central Scouting on Tuesday released its final rankings of the top North American and European skaters and goalies. Rounding out the top five in North America are: No. 2 Aaron Ekblad of the Barrie Colts; No. 3 Sam Reinhart of the Kootenay Ice; No. 4 Leon Draisaitl of the Prince Albert Raiders; and No. 5 Michael Dal Colle of the Oshawa Generals. Ekblad, who might be the only sure thing as the first defenseman taken off the draft board, and Reinhart, a center, each moved up one spot from the midterm; Draisaitl, a center, dropped two spots from No. 2 to No. 4. Dal Colle, a left wing, remained at No. 5. The scouts found no reason to move the 6-foot, 178-pount, left-shooting Bennett from his perch at the top. Considered by many to be a clone of Kingston general manager and Hockey Hall of Fame member Doug Gilmour, Bennett finished with career highs across the board in goals (36), assists (55), points (91), power-play goals (10), plus-minus rating (plus-34) and penalty minutes (118). He was the top vote-getter in three categories in the Ontario Hockey League's Eastern Conference Coaches Poll: Smartest player, best playmaker and best stick-handler. He also was voted third for best defensive forward. "There are guys who elevate their game when it matters most, and you're looking to project which players will do that consistently at the next level," NHL Director of Central Scouting Dan Marr said. "The guys we have at the top all are in that mold, but when we look at Sam Bennett we see a guy who could potentially have a Jonathan Toews type of career." Ekblad, who also finished with career highs in goals (23), assists (30), points (53) and penalty minutes (91) in his third OHL season, earned first-place finishes in the Eastern Conference Coaches Poll for best shot, hardest shot, best offensive defenseman and best defensive defenseman. He also was voted second in the category of best penalty killer. "I am always hesitant to label as a sure thing any young athlete as they have enough pressure on them as it is, but I would describe Ekblad as one of the most solid NHL prospects you will find in this year's draft class," Marr said. "He is the best defenseman available and would be projected to vie for an NHL job a lot sooner than most." Reinhart, who had 36 goals and 105 points in 60 regular-season games, is the son of former NHL defenseman Paul Reinhart, who played 11 seasons with the Calgary Flames and Vancouver Canucks. He also has two successful hockey-playing brothers. Max Reinhart was a third-round pick (No. 63) of the Flames in 2010 and Griffin Reinhart was selected No. 4 by the New York Islanders in 2012. "I would compare Reinhart to Adam Oates; he's a very cerebral player who takes what's given to him," Central Scouting's B.J. MacDonald said. "He probably has the highest hockey IQ of any player in this draft and he knows where to go with the puck, even before he even gets it." Draisaitl finished in a fourth-place tie with Reinhart for the Western Hockey League scoring crown with 105 points (38 goals, 67 assists) in 64 regular-season games. "What sets Draisaitl apart from other prospects is his ability to protect the puck. He's very Jaromir Jagr-like in that sense," MacDonald said. "He's got that same style. He'll connect with guys coming in late and hold onto that puck until the right play is there. He's got a great wrist shot and snap shot and has surprised a lot of goalies." Dal Colle, who had 39 goals and 95 points in 67 games for the Generals, finished second in the OHL Eastern Conference Coaches Poll in the categories of best stick-handler and best playmaker. "Michael has quietly gone about his business; never flashy but always good," Central Scouting's Chris Edwards said. "He kills penalties, plays the point on the power play and is as versatile a player as they come. For a big guy [6-1, 182], he's smooth and can score big goals. He's going to be a really good pro." Among the top 30 skaters ranked, 14 were from the OHL, nine from the WHL, five from the United States Hockey League and two from the Quebec Major Junior Hockey League. Central Scouting listed 23 forwards and seven defensemen among its first-round projections, including three players who were outside the top 30 at the midterm -- center Ryan MacInnis of the Kitchener Rangers (No. 33 up to No. 20), center John Quenneville of the Brandon Wheat Kings (No. 34 to No. 23) and left wing Brendan Lemieux of Barrie (No. 38 to No. 28). The player given the biggest promotion in the early rounds is No. 39 Hunter Smith, a 6-6, 208-pound right wing from the Generals. Ranked 140th on Central Scouting's midterm release, Smith had 16 goals (seven power-play goals) and 40 points in 64 regular season games. "He's made himself into a player," Edwards said of Smith. "He came into the league as a role-type of player and worked hard to develop his skill set. He's one of the toughest guys in the league but complements that with good puck-handling and passing ability. Big guys who are tough and skilled are very valuable in the NHL." The top-ranked American-born player on the list is No. 12 Alex Tuch (Baldwinsville, N.Y.) of the United States National Team Development Program under-18 team in the USHL. Tuch (6-3, 213) had 28 goals, 60 points, seven power-play goals and 56 penalty minutes in 53 games. The Boston College recruit is a prototypical power forward. "He's a big body and that's something you can't teach," Central Scouting's Greg Rajanen said. "He's got some grit to his game, is good around the net and physical. If you're in need of a power forward, Tuch's your man." The top-ranked U.S. high school player is No. 42 Luc Snuggerud of Eden Prairie High School in Minnesota. Snuggerud (6-foot, 180), a senior defenseman, had nine goals and 46 points in 28 games for the Eagles. He earned the 2014 Reed Larson Award as the top senior boys' high school hockey defenseman in Minnesota and had 19 goals and 108 points in 81 career games. Snuggerud is committed to the University of Nebraska-Omaha for 2014-15. There was no change at the top of Central Scouting's final rankings of North American goalies as Boston College freshman Thatcher Demko retained the No. 1 spot. Rounding out the top five were Mason McDonald of the Charlottetown Islanders (QMJHL), Brent Moran of the Niagara IceDogs (OHL), Alex Nedeljkovic of the Plymouth Whalers (OHL) and Kevin Reich of the Dubuque Fighting Saints (USHL). The top five skaters on Central Scouting's final European ranking are forwards: No. 1 Kasperi Kapanen of Kalpa in Finland; No. 2 William Nylander of Modo in Sweden; No. 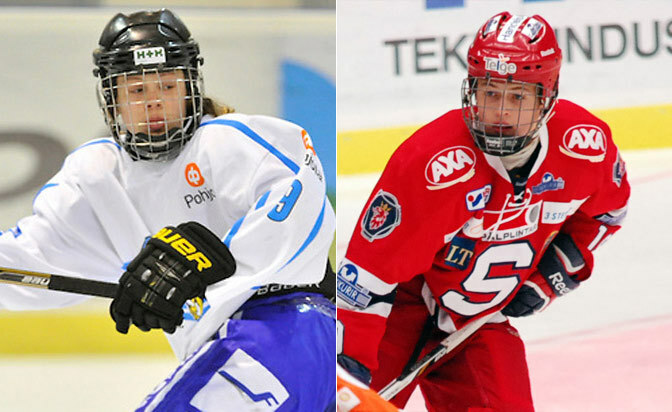 3 Kevin Fiala of HV 71 Jr. in Sweden's junior division; No. 4 Jakub Vrana of Linkoping in Sweden; and No. 5 David Pastrnak of Sodertalje in Sweden's second division.